Zainul Abedin's first memories are centered round unsophisticated life and landscapes, enlivened by the quite-flowing Brahmaputra river, majestically winding its way through idyllic, pastoral countryside. It was this simple beauty, with the sad introspection and certain tragic quality about it, which he later deftly captured in the scaffolding of his brisk, bold and strong lines and his soft, glistening water colors. His father was Police Officer and as he went on transfer from one district to another, young Abedin came to adore the green, reverie countryside marked by tall, graceful palm trees and coconut groves. Occasional hills and dales broke the monotony of alluvial plains, as in Sherpur, near the picturesque Garo Hills, where he had his first taste of primary school. Instead of sums, however, he filled his copybook with hieroglyphs, which he himself did not very well understand. His increasing interest in art, however was much to dislike of his parents, who naturally wanted him to shape as police officer! He was constantly scolded and admonished. Then, one evening, he ran away from his home with children's poem book of the banks of his favorite Brahmaputra river. There it lay, as far has he could see, nestling in the expansive countryside landscape, turning it into green carpet of miles of paddy fields. In front of him and all around him was bounteous nature spreading its arms. On the river were shining boatmen. In the fields worked women, with their graceful figure almost bare, ebonises by the vagaries of life in the open ,beaten by sun and rain. For the next many weeks, he roamed about from village to village, living with farmers and boatmen and working with them, occasionally using indigenous charcoal for sketches and illustrations that filled his book of poems. Months later, when this illustrated, and, of course, very much faded book of poems reached his headmaster, he was greatly impressed and persuaded disappointed father to send the young boy to Calcutta for proper art education. Life in Calcutta was difficult and friendless in the beginning, but it had its own compensations. In 1938, he received the Diploma of Fine Arts from Calcutta Art School and was immediately offered a teaching job at the same institution. He taught as well as painted, exhibiting his work and winning several prizes for amateur work in Art Exhibitions in the country, as well as abroad. In 1951, he visited London and later traveled widely over Europe. The whole body of his works have be seen in individual exhibitions in European capitals. 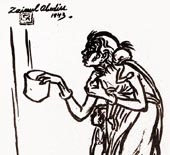 Zainul Abedin, painter as well as teacher, is himself the founder and leading artist of what has come to "Dacca Art Group". He was also the principal of Government Art Institute, Dacca, East Pakistan (now Bangladesh). His paintings and drawings have been widely seen and admired in composite exhibitions by UNESCO and various international bodies, as well as group exhibitions in Europe, Turkey, Japan, Mexico and USA. 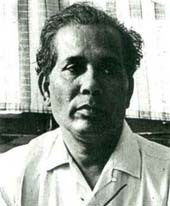 Zainul Abedin has painted extensively in wide variety of styles, ranging from purely objective and almost photographic to various abstract and semi-abstract studies. He was very interested in Japanese painting style.